XD-V 70/75 systems are rated at 300 feet under ideal conditions and the XD-V30 systems are rated at a 100 foot range. This â€œOpen Air Wireless Rangeâ€ also known as â€œLine of Sightâ€, meaning the transmitterâ€™s antenna must have a clear path to the receiverâ€™s antenna and be reasonably free of interference. For best performance â€œLine of Sightâ€ should be maintained between the receiverâ€™s antennas and the transmitterâ€™s antennas. Radio waves travel in straight lines and do not go around corners. Barriers such as walls can impede the path of radio waves depending on the thickness and the type of construction. RF will not transmit efficiently through metal barriers. If you have aluminum siding or a metal roof, it is unlikely the RF signal will transmit through this barrier with much efficiency. When using wireless systems indoors you could experience a moderate reduction in range compared to outdoors depending on conditions. RF will not transmit through the earth so if the receiver is placed in the basement, and the earth or ground is obstructing the line of sight transmission, it will not receive the direct signal. Human bodies also absorb RF energy and can affect maximum range so remember to place your antennas accordingly. Avoid cupping the bottom of the handheld mic as it will block the antenna resulting in a loss of range. Another significant reduction of range can be expected if the receiver antennas for the XD-V systems are very close to other intentional radiators in the same frequency band such as Wi-Fi wireless access points. Using the XD-V70 with remote paddle antennas and separating the antennas by several feet can be an effective way to mitigate this condition. Q: What is the difference between Analog and Digital wireless systems handling of interference? A: Since the XD-V wireless system is digital, it is able to â€œintelligentlyâ€ ignore all signals that are not specifically intended for it. As a result, no audible interference can be generated due to other RF signals occurring simultaneously with the XD-V RF signals. Additionally, the XD-V system utilizes a frequency diversity system in which four different RF frequencies are transmitted for each single audio channel. Only if there are errors or loss of signal on all four RF frequencies within a single transmission packet will an XD-V system mute. Loss of RF signal can be the result of trying to function at too great a distance, having unintentional transmitters too close to a receiver (near/far), or a significant amount of close-by RF signals within the same 2.4GHz range (Wi-Fi, microwave ovens, etc.). In all cases, the symptoms will be the same: reduction of RF LEDs on the front panel that indicate usable RF signal strength, followed by the audio signal muting. Once good enough RF signal is received again, the signal will unmute. Put simply, all forms of potential interference for the XD-V system will have the net effect of reducing the total usable distance for the system. If your application does not require maximum range, then typically little concern about other radio signals is required. If you intend to use your system at a distance, it is recommended that you â€œwalk testâ€ your system in advance of an event to verify that sufficient RF signal is available to avoid mutes from occurring over the entire desired range. Q: Why does the level change when I swap an XD-V digital wireless with my old wireless system? A: XD-V digital wireless are designed to be the same as a wired mic and are "unity" at the receiver's output relative to input to the transmitter. Most other wireless systems have gain stages that amplify the signal above the mic level itself. This means there is no relationship between the input level to the transmitter and the output level of the receiver. If the gain has been turned up on your old system then you will likely notice a drop in level when you hot-swap with an XD-V. This is a simple â€œgain-structureâ€ issue and is not a measure of sound quality. So if you hot-swap an XD-V wireless with the same mic as the model you have selected you will not need to make any changes to your gain structure. If you are replacing an older wireless unit that has gain added, you will need to balance the trim (gain) controls on your mixer inputs to accommodate the â€œunity mic levelâ€ of the XD-V. This is why mixer inputs have gain adjustments â€¦ so you can properly match mic preamp gain to the input source. Remember, XD-V digital wireless is mic level output only and must be plugged into a mic level input and not a line level input. If the trim controls are calibrated on your input strips a gain of 25-30 dB will probably be in the ballpark with an average vocalist. Q: What is different about the XD-V systems compared to the XDR-955? A: The XD-V30/XD-V70 systems use a higher frequency (2.4 GHz) and operate on 6 or 12 channels respectively, rather than 5. The XD-V channels numbers do not correspond to 802.11 Wi-Fi channels however. Q: Can the XDR-955 microphone be used with the XD-V systems? A: Both systems run in completely different frequency ranges so they are not inter-compatible, but X2 and XD-V units can be used on the same stage (along with any other analog wireless systems) with no problems. Q: Are the Relay G-series components compatible with the XD-V series components (or vice versa)? A: Because they both operate in the same 2.4 GHz frequency range, they are compatible. Q: Do the XD-V digital wireless systems share channels with the Relay systems? A: Both XD-V systems share their first 6 channels with the Relay G30. The XD-V70 shares all 12 of its channels with the Relay G50 and G90 models. A total of up to 14 systems can potentially be combined if the V70 firmware has been updated. A: Yes, but the hours and minutes are calibrated to alkaline batteries. Different battery chemistries discharge at different rates, therefore the battery meter reading may be inaccurate when alkaline batteries are not used. The run time will be directly related to the current capability of the batteries. Some experimentation will be necessary to determine how they perform for you. Carbon Zinc batteries should not be used with XD-V wireless systems. Q: Why is the battery meter higher when I restart than when I shut off the transmitter? A: Line 6 2.4G wireless transmitters have a circuit that measures the actual real-time voltage of the installed batteries and transmits that data to the battery meters in the receivers. The battery meters are very accurate when they have been running continuously since new batteries were installed in the transmitter and the transmitter power has not been cycled on and off. However due to the chemical nature of Alkaline batteries, when they have been shut off, the voltage begins to â€œrebound â€œ and the voltage actually increases compared to its value at shutoff. Unfortunately it does not last long and it reverts to true self over twenty minutes or so. For this reason when you first turn on a Transmitter that has been run but allowed to rest the meter will give a high reading that quickly falls over the first few minutes and continues to fall quickly for the first few minutes. This is normal behavior for Alkaline batteries. Q: What's the battery life of XD-V digital wireless systems? A: Battery life depends on the current capacity of the batteries used. Typically AA alkaline batteries can provide about 2400 mAh and will provide about 8 hours of continuous use from two AA alkaline batteries when run on "high" power. Typically you will get 10 hours on the "low" power setting. Be aware of "alkaline rebound" when turning off the unit and turning it back on, as it may look like it has more power than it really has. Q: Can the RX212 Receiver antennas be linked together? A: Up to 6 receivers can be daisy-chained together using the built-in antenna distro system. LMR-195 antenna cable is required for linking up multiple XD-V receivers. The last unit in the chain should be "terminated" (using the supplied term plugs) when linking receivers together. (Please see the Advanced User Guide). Q: What type of antennas work with the XD-V70 receiver (RX212)? Q: What mic capsules can be used with the XD-V handheld transmitters? A: XD-V Handheld transmitters have been designed to allow for the use of interchangeable capsules from 3rd party manufacturers such as Earthworks, Telefunken, Shure and others. However since there is no actual standard for compatibility there is some risk of unintended signal or mechanical issues. Users are advised to test specific combinations prior to purchase. Before replacing a capsule the power should be shut off. Simply screw on the desired capsule, then turn on the power. Mic modeling is bypassed (and not available) when using 3rd party capsules. Depending on the level of the capsule and the loudness of the person singing/speaking into it, the Environment filter may need to be switched â€œoffâ€ if a gating sound occurs. Q: What is the pin-out for wiring to a TA4F connector? For a normal, everyday, run-of-the-mill, Tip/Sleeve (TS) connector for a 1/4" instrument cable end,... the signal goes from 1/4" Tip to TA4F pin-3 (Signal), and 1/4" Sleeve goes to TA4F pin-1 (Gnd). Donâ€™t worry about pins 2 and 4, those are used for Lavaliere Mic connections. A: Questions often come up as to what mics are compatible with the system and how to adjust the gain to match other wireless systems. Line 6 XD-V70 beltpacks (TBP12) are essentially unity level devices meaning the output voltage of receiver essentially matches the input voltage of the transmitter. So it raises the questionâ€¦ â€œmatch the level to what?â€. Traditional systems are essentially a mic coupled with a preamp, not just a microphone alone. This may require thinking about your system in a new way. With traditional wireless systems that have limited dynamic range, gain and level control are essential if one hopes to have reasonable hiss free operation without excessive distortion. No gain or level matching is required when using XD-V wireless systems because of the XD-Vâ€™s wide dynamic range and compander free operation. So the system gain requirement is to have the speech or vocal input to the microphone present an appropriate level into the mic preamp so that the preamp can raise the voltage to be optimum into the next stage of the mixer. Gain is likely needed somewhere in this chain, but as long as the mic preamp has enough gain available there is no problem re-adjusting the input trim to do this. Just turn it up as much as needed. Just remember to plug the output of the XD-V into a â€œmic levelâ€ input on the mixer as it is not intended to be used into a â€œline levelâ€ input. In order to be able to certify a mic and being compatible one would have to know the distance from the userâ€™s mouth and the level of their singing/speech. The sensitivity of both the Line 6 HS70 and the LM4-T lav mic is -46 dB, so using a mic that is approximately the same in sensitivity will result in a similar output voltage to the factory supplied mic. If a lower sensitivity mic were used with any traditional wireless system you would need to turn up the gain in the transmitter, receiver and/or the mixer. If the levels of these three controls are not in perfect sync with each other the result will be extra distortion or extra noise/hiss. With Line 6 XD-V is greatly simplified. Simply make adjustments at the mixer (in the same way as you work with a mic with a cable). Much less complicated (although it may be different than what a user is used to) it insures maximum headroom and far less chance to get it wrong. Just turn up the mixer, thatâ€™s why the knobs move. Remember, the relative position of a knob means almost nothing. The correct place is the correct placeâ€¦ no matter where it occurs on the rotation. WL-184â„¢ lav is -44.5 dBâ€¦ so these mics would be almost identical to The Line 6 LM4. WH30TQâ„¢ headset is -55 dB so it will need a 10 dB boost of the mic trim control on the mixer as compared to the LM4-T to have the same level. E6 headsets come with different sensitivities and are specified per application. The E6ow7â„¢ is for â€œpowerful vocalsâ€ and will seem very quiet if used for â€œnormal speechâ€ as compared to our LM4-T. This would likely be a poor choice for general speech but could be the proper mic for a screaming singer. Countryman also provides caps to cover and further modify the mic element which can provide additional gain. * Please double-check that the Audio Technica mic is a model equipped with the TA4F connector. You may need to special order a unit with the correct connection type or refit your existing cable end with the TA4F plug. 4060â„¢ high output omni lav is â€“ 35 dB good with very quiet talkers or if the mic is some distance from the performer. Microphone sensitivity does affect the performance of the Environment Filter. If the sensitivity of the mic used is too low there may be audible artifacts. Depending on the situation it may be advisable to switch the filter to â€œoffâ€. Q: How do I connect multiple receivers for rack mounting? A: The XD-V 70/75 half rack sized receivers can be locked together to become a single rack width using the supplied "dovetail key". When mounting a pair of receivers side by side, start with the dovetail inserted approximately half way in the side groove. Then start the second unit, from the front towards the rear and slide until they are closely aligned. A small tap with a mallet and block will align and secure the key in place and level the front faces. Use the short rack ear supplied with each receiver to complete the pair. Multiple rack pairs can be linked together by using dovetail keys in the top and bottom slots of a rack pair. When assembling more than a single pair it is recommended that the left â€œhalfâ€ and the right â€œhalfâ€ be assembled first and then the â€œhalvesâ€ joined together into the 19â€ assembly. Q: Why does my Wi-Fi slow down when I get my transmitter near my computer? A: Because Wi-Fi and Line 6 2.4GHz wireless products share the same frequency band-space. Some users may experience a slowing down or even interruption of their Wi-Fi capabilities when using microphone or instrument transmitters in close proximity to their computers or routers. This is an example of a near/far interference problem and it may be intensified because consumer grade Wi-Fi typically has limited RF dynamic range. Using more XD-V channels operating at the same time will create more competition to Wi-Fi than a single channel would. If your Line 6 transmitter gets within 6 feet of your laptop you may witness this situation especially if your Wi-Fi access point is some distance away. Typically, simply moving your Line 6 transmitter farther away from your computer will remedy the situation. Users of Line 6 twelve channel systems can switch their transmitters to the â€œlow powerâ€ setting as this will mitigate the problem as well. If you are using the system outside the USA you can likely switch your Wi-Fi channels to 12, 13 or 14 depending on your location. The frequencies for these channels are outside the Line 6 2.4GHz frequencies. Likewise, switching Wi-Fi to 802.11n in the 5GHz band will avoid Line 6 wireless frequencies and double your potential Wi-Fi throughput. Suggested channels settings to avoid interfering with Wi-Fi. 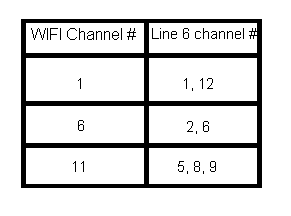 If your wifi network utilizes the channel listed, use the channel # listed under the Line 6 wireless channel column. Q: Why am I getting dropouts? A: Assuming no hardware issues, dropouts generally occur because of local conditions. Do I have clear line of sight? The transmitter antenna should be able to â€œseeâ€ the receiverâ€™s antennas. Is your audience blocking the line of sight? Raising antennas to 6-8 feet high will often fix this problem. Make sure you are not being blocked by obstacles such as metal posts, walls, etc. Are your antennas connected firmly and splayed at 90 degrees? If they are straight up and down you could fall victim to a dead zone. Are other XD-Vs operating on the same channel? Each system needs its own unique channel to operate on. Do you have the receiverâ€™s antennas near any intentional transmitters such as walkie-talkies, In-Ear Monitors, etc? They will need to be separated. The distance will depend on the strength of the transmitter and the gain of the transmitting antenna. Are you using the factory power supply? If you are using a substitute supply you must make certain it can supply the required 9vdc at 350 ma. Q: Why is the signal so weak compared to other wireless systems? A: XD-V digital wireless systems have "mic level" outputs (both XLR and 1/4" jacks) and need to be connected in the same manner as wired microphones are and with similar gain/trim settings. Plugging into a "line level" input or a channel with pads engaged will result in a weak and likely noise signal. The preferred connection is with the XLR output on the receiver to an XLR input on the mixer. The 1/4" output is unbalanced and is included as a convenience for users plugging into instrument amplifiers. It is important to NOT use TRS plugs into this jack as the "ring" is used for system upgrades and carries digital information that could be "noisy" if it were connected to an audio input. Q: Why is the sound so "thin"? A: This may be caused by the "Environment Filter" is the signal is too weak, especially when using lav mics. Try turning the filter to the "off" position. Q: What does the Near/Far spec mean? A: The Near/Far interference problem is common to all radio systems and happens when a strong RF signal in the same band uses a large portion of the available gain in a receiver making it difficult or impossible for the receiver to decode the weaker signal. Imagine having a conversation in a quiet room with a person 20 feet away from you. It is likely that you can carry on a conversation with normal voice levels. Now if you move to a noisy environment, with lots of other voices right around your ears, it may be very difficult for the conversation to continue with your long distance friend without the both of you shouting. A similar circumstance occurs with radios, and since the long distance transmitter is incapable of increasing its power output, it is very likely a very near transmitter may interrupt it. In the real world, this is rarely an unmanageable problem. You should avoid having a transmitter closer than 3 feet to a receiver that is not on your channel if the intended transmitter is more than 50 feet from this receiver. If this is a regular requirement you should install remote paddle antennas (G90, XD-V70 series). The near/far spec for XD-V70 is 50â€™/3â€™ which means if another transmitter (even though it is on a different channel) gets within 3 feet of your channels antennas at the same time you get 50 feet away the system could be affected in a negative manner.. By increasing the distance between antennas (using the paddle antennas) or simply raising the units up higher, it will become far less a possibility. Q: What do the different LED colors mean on the XD-V system components? Transmitter on same channel as receiver: Green to indicate signal strength/quality: from 5 Green = Data excellent, interference low to 1 Green meaning Data minimal, may have significant interference. 1 Red = No data, some potential interference up to 5 Red = No data, high potential interference. Channel LEDs - Illuminates blue to show the current active channel THH06 is transmitting on. Channel 6 LED will illuminate red when battery life is low and blink red when very low (change batteries). Q: Does USB 3.0 create interference in the 2.4GHz frequency range? A: USB 3.0 computer cables and peripherals, including hard drives, are known to emit radio frequency interference throughout the 2.4GHz band, which results in reduced range and/or performance for any 2.4GHz device in its proximity (including wireless keyboard or mouse, WiFi, etc.). We recommend placing any digital wireless receivers at least two meters away from the USB 3.0 device and its cabling. Below is a link to a study by Intel regarding this interference.